Huge Savings Item! Save 12% on the USB 3.0 to Ethernet Adapter - [Plug & Play] Syncwire 10/100/1000 Mbps RJ45 LAN Gigabit Ethernet Adapter for Macbook, Mac Pro/Mini, iMac, HP, Lenovo, Dell, Surface Pro, Windows 10, 8, 7, XP & More by Syncwire at Andy Pemberton. MPN: SW-AD061. Hurry! Limited time offer. Offer valid only while supplies last. OS Compatibility: CHROME & MAC & WINDOWS UNIVERSAL COMPATIBLE with -Windows 10/8/8.1/7/Vista. -Mac 10.6/10.7/10.8/10.9/10.10/10.11/10.12. -Linux. -Does not support Windows RT or Android. There's the Realtek smart chip built in Syncwire USB 3.0 to Ethernet adapter. Support Plug & Play. No external power and software drivers are required. The USB 3.0 and Ethernet connector is made with automated welding technology. The wire outer jacket is made from tear-resistant and high-elasticity TPE material. With high-quality and sturdy engineering, Syncwire USB 3.0 to RJ45 Ethernet adapter is a must have for you. Supports data transfer speeds of up to 5Gbps, 10 times faster than USB 2.0 devices. It is also backwards compatible with support for USB 2.0 and USB 1.1 standard devices. Ideal solution for replacing a failed network card or upgrading the bandwidth of an older computer. Advanced multiple special shield prevents any interference to help maintain the integrity and purity of digital signals. Bring crystal clear image and voice to your digital life. Diagnostic LED indicators on the USB 3.0 to Ethernet adapter verify the network connection and data transfer status. Supports performance features including WoL, FDX, HDX, crossover detection, backpressure routing, and auto-correction. Friendly warranty support without any other costs needed. Fast and easy-to-reach Customer Service to solve your problems within 24 hours. Fast Speed - USB 3.0 to Ethernet adapter connectivity to a computer supports data transfer speed of up to 5Gbps, 10 times faster than USB 2.0 devices. They are also backward compatible with USB 2.0 and USB 1.1 standard devices. Plug & Play - No external power or software drivers are required. Syncwire features include Wake-on-LAN function, Green Ethernet, and IEEE 802.3az-2010 (Energy Efficient Ethernet). Even more, the adapter supports IPv4/IPv6 pack Checksum Offload Engine (COE) to reduce the Central Processing Unit (CPU) load. Superior Signal Delivery - Thanks to USB 3.0 connectors, tinned annealed copper wire, and overall tinned-copper-braid shielding, Syncwire USB 3.0 to Ethernet adapters deliver a superior signal. 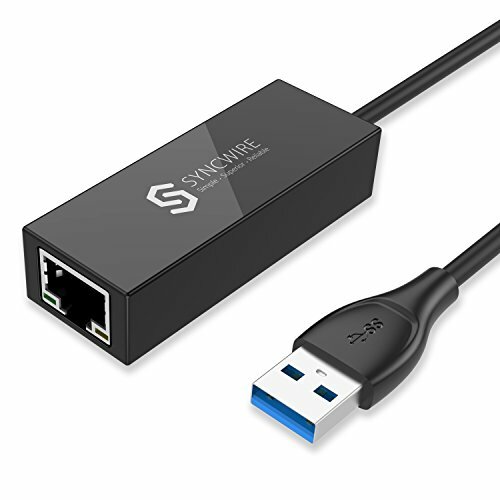 Perfect Compatibility - Syncwire allows you to connect a USB-enabled device (computer/tablet) to a router, modem, or network switch to deliver Gigabit Ethernet to your network connection. It is compatible with Windows 10/8/8.1/7/Vista/XP and Mac 10.5/10.6/10.7/10.8/10.9/10.10/10.11/10.12, Linux, and Chrome OS (not supported by Windows RT, Android, or Nintendo Switch). Premium Support - We put our company and its full resources behind our products. Our products come with friendly warranty support without any additional costs. Fast and easy-to-reach customer service representatives will solve your problems within 24 hours. If you have any questions about this product by Syncwire, contact us by completing and submitting the form below. If you are looking for a specif part number, please include it with your message.